This interview with a member of Borotba, a Ukrainian left-wing organisation, analyses the situation of the left in the east of Ukraine in the ‘Peoples Republics’. 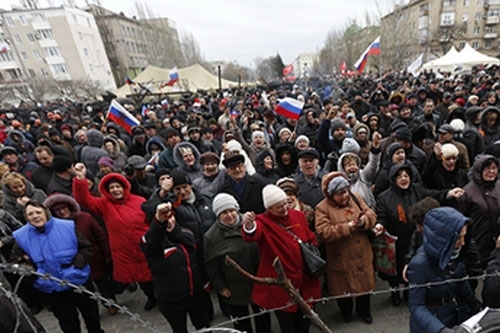 It points up the role of Russia in holding back any developments to the left, including blocking the recently refounded Communist Party in east Ukraine from standing in the elections held in October precisely because it has mass support and would probably have won. However, it should also be noted that it is only the pressure from Russia that forced Kiev to agree the ceasefire that significantly reduced the bombardment of eastern cities. The article was previously published on the website of Solidarity with the Antifascist Resistance in Ukraine. Q: You have been in Donetsk recently and you are in close contact with militants there. How are things developing there? A: Since the cease-fire the military front has been more or less stable. Of course, there are frequent violations of the agreement, the Kiev troops continue to shell Donetsk, for example, but there are no larger battles. Politically, however, things are certainly moving. Of course things don’t go in only one direction, you can say we have two contradictory developments, which are dialectically connected. On the one hand, the influence of Russia or, more accurately, the Putin administration, is strong and even getting stronger. This can be seen in the fact that several military and political leaders, who came forward more or less spontaneously in the spring, have been removed and replaced by people who are more obedient towards Moscow. The “civilian” leadership, still in place from the Yanukovich regime, has always been like this. On the other hand, some of the “spontaneous” leaders did succeed in establishing themselves. One very well known one is Alexey Mosgovoy, leader of a brigade bearing his name. His political view is that the oligarchs are to blame for the disastrous situation and, therefore, he is against the privatisation that made these people rich and wants to expropriate them. This is a practical question because the “Eastern” oligarchs, who formerly supported Yanukovich, now support the new Kiev regime. Best known of these is Rinat Akmetov, owner not only of the football club Shaktar Donetsk, but also of many mines and factories. Although he could, and did, shift the football team to Lviv, that’s not so easy, even for him, with a mine! The mines stopped working because of the shelling, some factories are working, others are on strike. So why not expropriate Akmetov? Many workers in these work-places think this is only fair, they feel betrayed by him. Putin’s men, of course, are against that. They either want to use these assets for bargaining with the west or to have them taken over by Russian oligarchs. To promote progressive ideas among the fighters, Mosgovoy installed propaganda departments in his brigade and asked communists to help him with this task. He formed a special “communist battalion” [VIDEO: https://www.youtube.com/watch?v=og1UzzFFMdU] out of communists, among them many antifascists from abroad. This does not mean only from Russia, but also from the West. 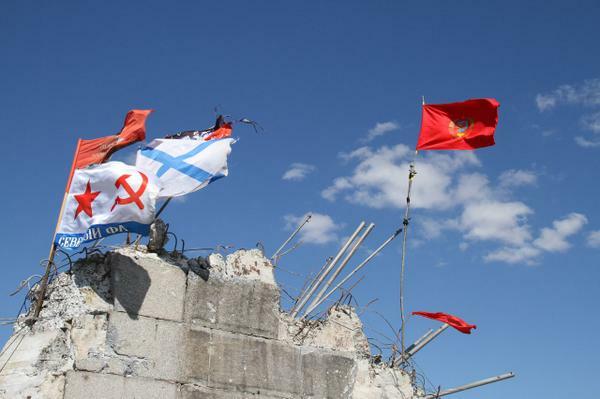 These troops are fighting under red banners as opposed to the others who use Russian, or even monarchist, flags. But the Mosgovoy brigade is not the only one that does that. There is also the unit of Dryomov, who established a sort of “military communism” in the towns under his military control; goods are distributed on the base of equality. However, he has not established a propaganda department. The largest military force fighting, at least partly, under red banners, are the “Red Cossacks” which, of course are not a mounted force. In fact, many miners and other working-class people have joined this force. You could say they had no choice really because they don’t have any work anymore. These units are a real “people’s army” consisting of members of the working class and the lower strata of society, young and old, men and women. Q: What was the outcome for the left in the elections in the “People’s Republics”? A: The elections took place at the end of October, but communists were not allowed to participate. The Communist Party had just been re-founded out of the old Ukrainian CP, but they had no chance. Of course, as revolutionaries, we were critical of the whole procedure anyway, we proposed the election of Councils. A representative of the Kremlin told one communist leader, Litvinov, that if the CP had been allowed to stand, they would surely have won. He said that “Our partners in the West would not have understood this and would have blamed us for that.” He asked for understanding of his position! 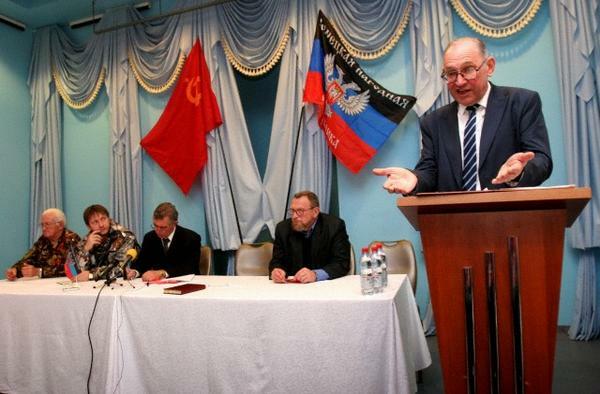 Nevertheless, the same Litvinov is now the Speaker of the Donetsk Region Council, having somehow found a way to stand on a “mass organisation” list. Q: How would you characterise these communists? A: Most people of course still understand “communism” in the sense of the old Soviet Union. As in Ukraine as a whole, or in Russia for that matter, the level of political understanding is not very high. In effect, there has never really been a critical assessment of Stalinism, but there is a clear turn to the left. Q: I assume that the economic situation is bad? A: Of course. Some factories are still working, but even the supply of everyday needs is precarious. The people’s republics are dependent on help from outside. If we had more peaceful times, they could export coal, for example, even to other parts of Ukraine, because they cannot produce enough in the western part of the country. Many factories are not working at all, but some, where the owners have left, are working under some form of workers’ control. Q: What is the best way for us help? A: The best solidarity is to spread the truth about the situation in East Ukraine around the world. Don’t leave it to the bourgeois media. Even though the Russian state media sometimes are closer to the truth than the western, they represent the Kremlin administration. Better is to look at krasnoje.tv or “trench-truth”, but they do not translate much into English. I don’t think it makes sense to send material goods. The transit is difficult and in fact most things can be bought near the border in Russia. Of course, we do need money, however. Q: Is there anything more you want to say? A: Yes! Please tell all the world that this is a civil war. It is not between nations and not between nationalities. There are Ukrainians fighting on both sides as well as Russians, Armenians and Jews. It’s about fighting against fascism and for the interests of the working class. A defeat for the East would be a catastrophe for the Ukrainian working-class as a whole! The last months have revealed this even more clearly! This article previously appeared on the website of Solidarity with the Antifascist Resistance in Ukraine and was originally published by the LFI.